At Magnolia Family Dentistry, we believe you and your family deserve the best dental care available. That’s why we’re dedicated to continuing education, so we remain on the forefront of treatment options and technologies. Then we share this new knowledge and invest in new technology to bring back home to our family of patients in Midwest City. Don’t settle for old and outdated, get the most advanced diagnostic and treatment techniques right here from the comfort of your dental home. If you’d like to see and feel how our technology can improve your dental experience, call or schedule an appointment online with Dr. Leaha Nels at Magnolia Family Dentistry! Digital x-rays have been one of the greatest advancements in modern medicine and dentistry, reducing your exposure to radiation by up to 90%! 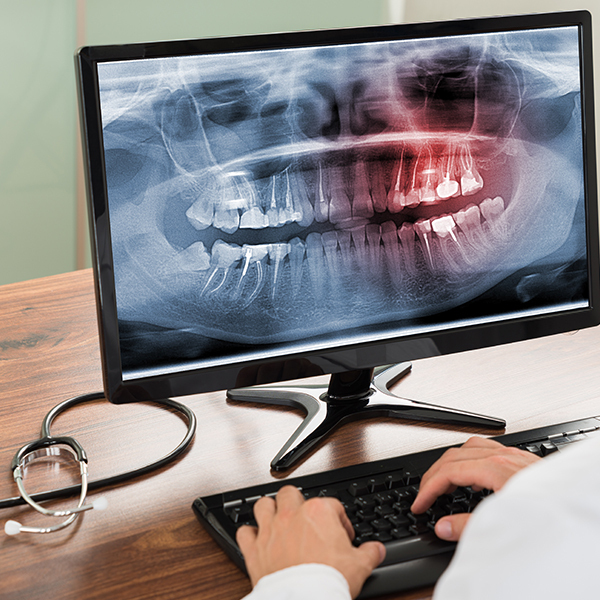 Plus, digital x-rays are far faster and more convenient as they can be taken in a matter of moments right from the dental chair and viewed almost instantly on the screen. With improved speed comes increased accuracy so there’s less room for human error and we can better detect disease and decay. We know having dental work done is not always the most comfortable experience, that’s why we’ve invested in air abrasion technology. Air abrasion, for many procedures, can eliminate the need for the dental drill. Air abrasion works like a tiny sandblaster for removing areas of decay without the need for uncomfortable and invasive techniques. Air abrasion allows us to conserve more of your healthy tooth structure, while ensuring you remain comfortable and stress-free. Now that’s something to smile about! Intraoral cameras are one of our favorite tools here at Magnolia Family Dentistry. In the past, oral exams were performed visually with the help of a dental mirror to peer around corners, but we all know our eyes aren’t always the most reliable source. Thankfully, we now have intraoral cameras that allow us to obtain high-resolution, real-time digital images that can be significantly magnified. This allows us to detect disease and decay sooner, and also allows you to see what we see so you can better understand your oral health and treatment needs. Healthy saliva is essential for maintaining the pH balance of your oral environment, which is essential for fending off disease and decay. Dry mouth can be caused by many factors, including certain medications, dehydration, smoking, and other diet and lifestyle habits. Thankfully, we have a solution for you at Magnolia Family Dentistry. Dry mouth treatments come in many forms, ranging from rinses, to tablets, to sprays, and more. We would be happy to recommend a product that’s right for you. All toothbrushes are not created equal. Are you using the right toothbrush for your personal needs? If your answer is, “I don’t know…” that’s ok! You’re far from alone, and we’re here to help. We can recommend and offer a toothbrush that is just the right shape, size, and softness for you or your little one. We highly recommend electric toothbrushes these days, as they really do provide a better clean—and with less effort! If you have any questions or you’re ready to schedule a visit with your Midwest City dentist, Dr. Leaha Nels at Magnolia Family Dentistry, give us a call today or request an appointment online!